Tarot Lenormand – two card reading systems that provide answers about your life, but when you read them together they're so much more. 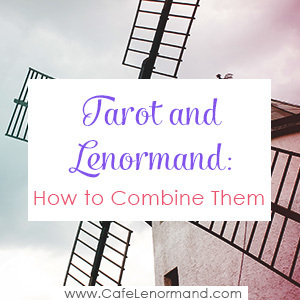 You've probably heard about how different Lenormand and Tarot are. Heck, I've even written about it (see Lenormand vs. Tarot: What's the Difference? for more). Yet, there's a way of combining Tarot and Lenormand where the two systems really compliment each other. The secret lies in reading Tarot with Lenormand techniques, not in reading Lenormand with Tarot techniques. This allows you to add another dimension to your reading, even clarifying what the cards are telling you. The two decks work together to form a powerful tool, each providing a different layer of meaning that you wouldn't get with just Tarot or Lenormand alone. Tarot and Lenormand combined gives you the psychological nuances (the underlying motivations, hidden shadows, archetypes, conscious influences, and the the unconscious and subconscious factors) of Tarot along with the blunt, straight-to-the-point insight of Lenormand. As I said before, the secret to combining Tarot with Lenormand lies in reading Tarot with Lenormand techniques. Lenormand just doesn't mesh well with Tarot techniques. When you try to read Lenormand with Tarot techniques, even if it's just using Lenormand cards in a predetermined Tarot spread, like the Celtic Cross, you limit Lenormand. The beauty of Lenormand readings lies in the fluidity of the cards. They're able to provide detailed answers all on their own, without being assigned a specific meaning for where they fall in a spread. Yet, Tarot can be read with Lenormand techniques quite well, particularly when it is combined with Lenormand. Tarot will provide a new light on the reading whether you just lay out a few cards randomly or you assign the Tarot cards a predetermined meaning (such as past-present-future or motivation-advice-outcome). One of my favorite ways to combine Tarot and Lenormand is in a 5-card spread, allowing the cards to “bounce” ideas off each other. You'll notice the spread is quite similar to a Lenormand 5 card spread. You're just adding a second row of 5 Tarot cards. It doesn't matter whether you put the Tarot cards in the first or second row. I just listed Tarot in the first row for convenience as that's how I normally lay the cards. But the beauty in the spread lies when you read the Tarot and Lenormand cards together. Take Tarot card 1 and read it with Lenormand card 1, allowing the cards to clarify one another, adding an extra dimension to the reading. For example, if Tarot card 1 is the Page of Swords and Lenormand card 1 is the Sun, you might read it as quick thinking brings success. Continue this with the other cards. Tarot card 2 combined with Lenormand card 2, Tarot card 3 with Lenormand card 3, and so on. When you're done, if you want some additional information, you can read the row of Tarot cards, analyzing each card individually or in combination à la Lenormand. You can also read the Lenormand cards as you would a Lenormand 5-card spread. 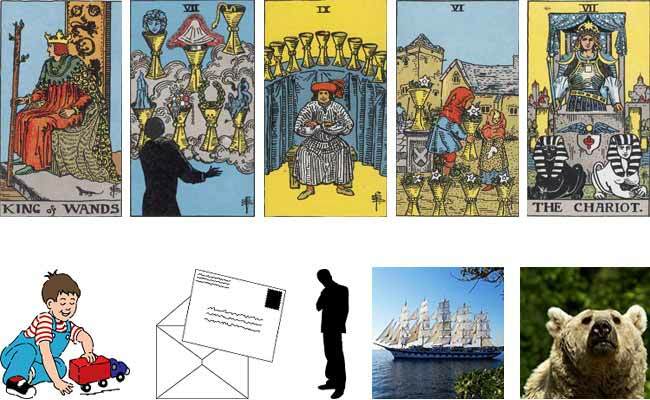 Over the years, I have discovered that combining Tarot and Lenormand in a spread to find out what someone is thinking is freakishly accurate! I'll admit I haven't used it for over a year because it truly reveals someone's innermost thoughts and secrets. However, I want to share it with you because it's an easy way to illustrate the beauty of a Tarot Lenormand spread…and well, to be honest, don't we all wonder what someone is thinking at some point in our lives? This is a spread I did in May 2011. It startled me at the time because it revealed something I truly wasn't expecting. I was just playing around with the cards and was curious if Tarot-Lenormand could even answer this question. I thought asking what my best friend, S, thought of me was safe because I thought I already knew the answer. It turns out he was thinking a bit more than I realized. I'm providing this Tarot Lenormand spread to help you see the benefits and dangers of this type of spread and question. What does S think about me? 2. 7 of Cups + Letter: He thinks messages from me are like a dream that he needs to make a decision about; they're a temptation. 3. 9 of Cups + Man: I'm what he wants. I make him happy. He thinks that if he pursues me, he'll get me. 4. 6 of Cups + Ship: The distance between us makes things seem innocent to him. It causes him to think about me with nostalgia about what could have been. 5. Chariot + Bear: This can be interpreted 2 ways. 1) He sees me as having the strength and determination to achieve my goals. 2) He has a duty to the mother of his children that is causing him to stay where he is, using self-discipline to assert control over the situation. I swear this spread was such a shock to me that I actually drew 2 additional cards. Tarot Star and Lenormand Sun which confirmed the reading. There was a lot of distance between S and I at the time, resulting in our using email as our primary method of communication. I later learned that our emails meant a lot to him, but also tore at his heart as a reminder of what he didn't have but wanted. He and the mother of his children had a very difficult relationship and he was only with her out of duty. He did end the relationship with the mother of his children that year and revealed that he loved me the following year. We had been best friends for most of our lives and he confessed he was interested in more than a friendship the entire time, but never had the guts to act on it because he didn't believe he was good enough for me. Even though this spread pointed at it, I didn't expect what he revealed and tried to ignore everything, even encouraging him to try to work things out with his ex. So that's how you can do a Tarot-Lenormand spread. But like I said, be careful what you ask the cards because the information can be quite startling and extremely accurate. * Tarot images are scanned from the 1909 Rider-Waite-Smith Tarot deck that is in the public domain. 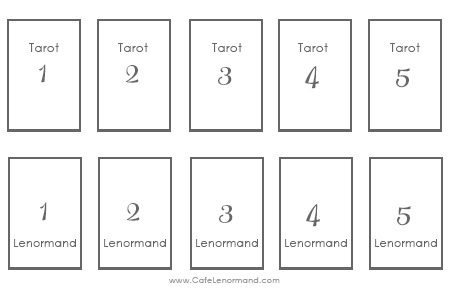 Mirroring Lenormand: What is it and how can it improve your readings? Thank you, this is so timely because I’ve been experimenting with ways to combine tarot & Lenormand! I’m definitely going to try this. What I’ve been doing for example is to see tarot as internal & lennies as external factors, adding 3 Lenormand cards as clarification in a regular tarot spread such as a line of 3. It works really well so far 🙂 but I’m going to try this one too! I’m glad it’s timely for you! I hope you enjoy this way of combining them. Wow, that is a powerful combination! I have been reading cards since a child ( more than 40 years ago), and have only picked up the lenormand recently. I am still spooked by how eerily accurate they are! Very interesting! I was curious how to combine the two decks for an upcoming fundraiser. Thank you so much. Will practice until then! Hi, thanks for the spread! I have a few questions and will be grateful for a feedback. My combination: 1) Eight of Wands + Stork, 2) Empress + Clouds (=Key), 3) Three of Pentacles + Ring, 4) Page of Swords + Moon, 5) Three of Cups + Fish. As a sum-up I had Ten of Cups + Stars. I think of 1) as he feels my thirst for action brings him something new in his life; 2) he is rather confused by my strong femininity as he perceives me this way (the key? it delays his action? ); I have a problem with 3) he feels like he would like to commit as we share a lot on an intellectual level/or: he is married but wishes for an affair cause he feels attracted? 4) he would like to obtain more information about me, he is curious and would like to ask me a lot of questions; 5) similarly to 4) I have trouble interpreting this one: he thinks I bring joy and happiness and he thinks he could participate with his resources to join? As a summing-up I chose Ten of Cups with Stars: could it be that he wishes for us both to be a couple/family? I will be happy to receive any helpful comment and interpretation. Here we are in 2018 and I just stumble on this article. I’m the opposite of you, having been using Lenormand for few years and starting now with the Tarot. I find it fascinating to use the two systems together and going to practice it. Thank you for your site, years ago when I started to learn Lenormand you were a great help. (Just one small detail, I have noticed that in your example spread you have combined the 6 of cups with the Ship when it should have been combined with the Bear I think). I will try to interpret it that way, good learning experience for me. Hi Annie, Thanks so much for catching that! No one has noticed it in 4 years, not even myself. I went back over my notes and the reading was correct. I put the images up in the wrong order. It’s fixed now. I hope you enjoy combining Tarot and Lenormand! They complement each other nicely.